Rated 5 out of 5 by MP Man from Nothing Better Than HST I have been using this ammo in my M&P 1.0 .40 for a few years now. When I do my ballistics gel tests it never fails to do as your company states it will. I wouldn't want to be on the receiving end of this bullet. Rated 5 out of 5 by RRuss from HST IS THE BEST!!! I've shot the HST into many water jugs myself, & it mushrooms exactly as shown! I 'know' this is the best available to the public, after months of research! Thank you, Federal! Rated 5 out of 5 by healthnut from THANK YOU FEDERAL!!!! I'm so thankful that they made these easier to get than before. I am a huge fan of this bullet. I trust it with my life. I urge anyone to do the same. 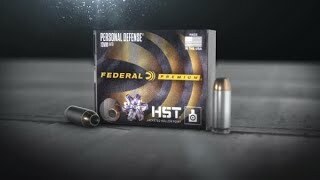 Rated 5 out of 5 by FMJAR15 from Excellent Barrier Penetration Thank You FEDERAL for offereing us PUBLIC the HST Bullet! The Honest Citizen should be able to defend his family with the same quality ammo as our law enforcement. HST bullet wont plug as easy as the older design bullets. HST also has excellent expansion compared to older handgun bullets . Now can we have a 38spl 147gr+P HST!!! All 6 of my fixed sight S&W Jframes have a POA/POI using 158gr Also the 148gr Target WC is pretty close. This is why I want a 147 to 158 gr HST loaded in 38spl+P and design to expand well with a 1 7/8 barrel.